Bosch AQT 3400+ Pressure Washer reduced to £49.99 (half price) at Argos. Can reserve to collect in store so no P&P. Other Bosch Models are also discounted but no other are half price. Well which is it guys? Great or good? Is this any good for washing the outside walls of a house too? I have the model or 2 up and it's brilliant. The extra accessories are great especially the snow foam attachment. Worth it for the money. I have the model or 2 up and it's brilliant. The extra accessories are … I have the model or 2 up and it's brilliant. The extra accessories are great especially the snow foam attachment. Worth it for the money. ​out of interest which model do you have please? I have the AQT 37-13 130 bar pressure. It's a great machine and it was £85 from B&Q which was nearly 1/2 price. This one for £50 is still great price. Can you adjust the pressure on pressure washers to below the max pressure for more delicate areas? I'm looking all purpose pressure washer light to medium tasks. I especially looking for patio and garden cleaning...Is it good pressure washer to buy? I am skeptical about 80 bar pressure will good for Patio & Garden cement slabs. Is this better then the kraecher ones?? I'm looking all purpose pressure washer light to medium tasks. I … I'm looking all purpose pressure washer light to medium tasks. 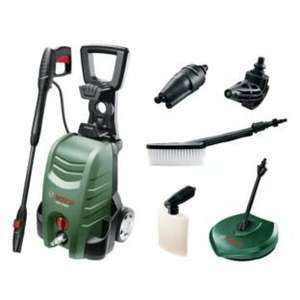 I especially looking for patio and garden cleaning...Is it good pressure washer to buy? I am skeptical about 80 bar pressure will good for Patio & Garden cement slabs. same price on argos ebay with C&C to local store if you can't find one. with pressure washers is not about how many BARs but about water flow per minute/hour, more means better. I bought a pressure washer a couple of years ago. Thought it would help wash the car. It doesn't. Even if I use it I still need to use bucket and sponge to clean the car. Decided that I just miss the pressure washer stage off instead. Have I got it wrong? Is there a super ninja way that I am missing here? Or are people using this for other reasons? Great deal but no stock anywhere local to me. Was thinking of getting one for my dad. Does this model come with the snow foam attachment? Shamazon got Karcher K2 compact air cooled washers at £59, 110 bar. 4.6/5 stars. Didn't need one. Heat added. Purchased! I bought a pressure washer a couple of years ago. Thought it would help … I bought a pressure washer a couple of years ago. Thought it would help wash the car. It doesn't.Even if I use it I still need to use bucket and sponge to clean the car. Decided that I just miss the pressure washer stage off instead.Have I got it wrong? Is there a super ninja way that I am missing here? Or are people using this for other reasons? Use the pressure washer to blast off the larger chunks of dirt from your car and to clean the arches etc. Then use a snow foam attachment to cover the car in foam. Let that dwell as per the product's instructions then rinse off with the pressure washer. looks good dam have to opt for delivery. Use the pressure washer to blast off the larger chunks of dirt from your … Use the pressure washer to blast off the larger chunks of dirt from your car and to clean the arches etc.Then use a snow foam attachment to cover the car in foam. Let that dwell as per the product's instructions then rinse off with the pressure washer. Just watched a youtube video on snow foam. Looks like fantastic fun if not anything else. Get the karcher k7. I clean patios for a living and this matchine is a beast. Just watched a youtube video on snow foam. Looks like fantastic fun if … Just watched a youtube video on snow foam. Looks like fantastic fun if not anything else. I will give it a go.